FA: Dale Bard, Bob Locke. July 1976. 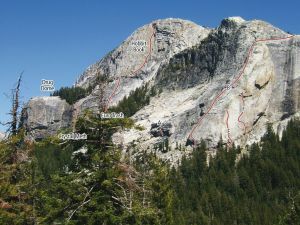 A classic, wildly steep testpiece of the 1970s, Scorpion is easily one of the best routes of the grade in Tuolumne. Steep face, slab, and crack climbing on three superb pitches leads to a quick rappel to the base. The bolts are camouflaged tan and can be hard to spot. Which SuperTopo guidebooks include a topo for Scorpion?